Paint on the toy horse contains excessive levels of lead. The recall involves about 300 horse toys. The toys have a push-up base. When the base is pushed up, the toy horse is floppy. When released, the toy horse stands up straight. 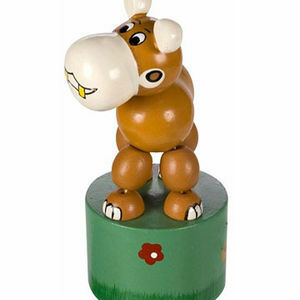 The horse is brown and white, and the base is green with orange, red, and blue flowers. Hobby stores, gas stations, gift shops, and toy stores nationwide from February 2008 through April 2008 for about $4. Take the recalled toy away from children immediately and return it to the store where purchased for a full refund. For additional information, contact Toy Investments Inc. at (800) 356-0474 between 9 a.m. and 5 p.m. PT Monday through Friday, or visit their Web site at www.toysmith.com.